A compulsive experimenter, Turner was a thorny devil; a painter whose work ranks among the most visually audacious that any British artist has ever produced and yet, across the age groups, across the social divides, he is still the country’s most celebrated and indeed most cherished artist. We love him because he challenges us, dares us even, to keep looking; and the more he does so, the more we look; and the more we look, the more deeply we fall in love. And then of course there is the sheer volume of his output. In scope and in scale he managed to churn out a seemingly endless stream of dazzlingly beautiful paintings, treating an equally dazzling range of subjects: battle scenes, shipwrecks, avalanches and snow storms. This painting, though, is quieter, more subdued, which is partly what draws me to it. In many ways, the story it tells is less about a place, the Harbor of Dieppe, than it is about Turner’s increasing fascination with the dramatic effects of sunlight. Turner completed the painting in 1826, a year after exhibiting it in the Royal Academy, along with its companion piece Cologne: The Arrival of a Packet Boat: Evening, the one set at dawn, the other at dusk. As with most of his paintings, the composition was drawn from sketches made in situ, these dating back to his 1821 trip to France. Dieppe Harbor (on the coast of Northern France) at the beginning of the nineteenth century was a bustling commercial hub. 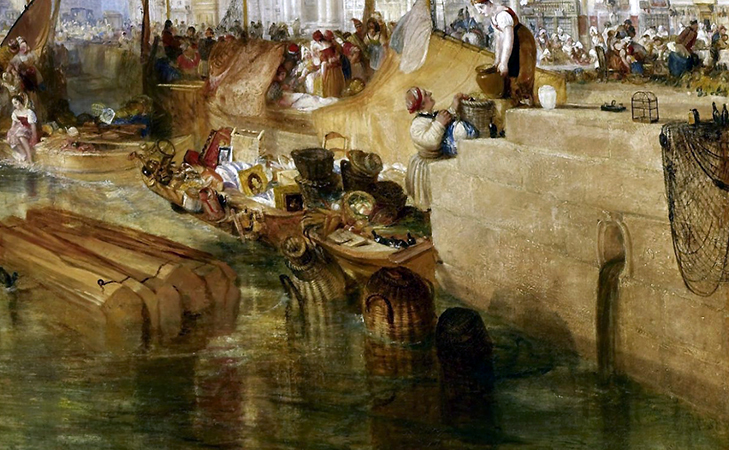 Turner delights in capturing the throng, populating the waterfront with crowds of people going about their daily business, some industrious, others less so. To the right, a sluice flows into the sea through an outlet on the harbor’s wall reminding us of the polluting effects of the crowd’s activities, a point intensified by the numerous empty bottles of alcohol littered on the harbor’s edge. These references to the mundane and the sordid are not, however, what first strikes us about the painting, rather it is that marvelous sun, creating a great ball of light in the sky which spreads out like a sheet of gold across the surface of the water. 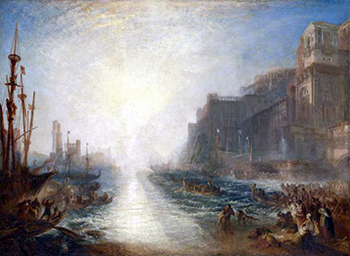 Art historians argue that Turner’s fascination with light during this period was inspired by a visit to Italy he made in 1819. Turner’s contemporaries noted this as well. Some in fact criticized him for transposing a Mediterranean light onto a Northern European setting, a criticism that reveals a tendency to idealize the Italian countryside as some kind of pastoral idyll in contrast to the more industrialized landscape of the north. Turner himself was probably sympathetic to this view and the painting can be read as a Romantic response to the expansion of international commerce that followed the Napoleonic wars. While the water facilitates trade, allowing the free flow of capital, the gloriously sublime quality of the sun serves to remind us that we are not the ones in control. The light overwhelms us, short-circuits our powers of visual deduction so that we are constantly distracted from the bevy of everyday activity that it is actually taking place and are forced to experience the scene in an emotional and very personal way. “Not even Claude in his happiest efforts, has exceeded the brilliant composition before us,” wrote one. 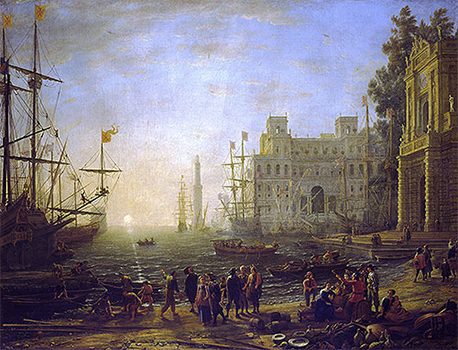 As in Claude’s Port Scene with the Villa Medici, a painting Turner makes reference to frequently in his own work, the shadows cast by the boats to the right in The Harbor of Dieppe act to draw the viewer’s eye into the painting, a technique known as repoussoir. Like the Claude, the diminishing scale of the sails adds to the illusion of depth. 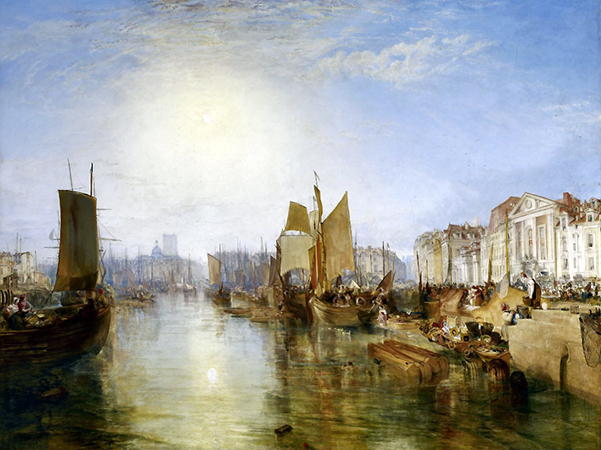 And as with Claude’s treatment of the villa, Turner has carefully worked out architectural features such as the steps at the harbor’s edge and the row of houses on the right of the canvas. These create tidy orthogonals that guide us into the painting and enhance the illusion of space. Another Claudian device is the use of light to create aerial perspective, in which under the glare of the sun, objects in the distance lose their local color and merge into a pale bluish grey. This is particularly noticeable in the treatment of the church tower at Dieppe whose soft, hazy outline juxtaposes the harshness of that of the sail in the foreground to the left. This too serves to take us away, to transport us from the seedy details of life in a nineteenth century port town to something that touches the divine. Again and again then we come back to light, the single unifying feature that both inspires and shapes the composition. Some of Turner’s contemporary commentators took exception to this and what they took to be Turner’s excessive use of yellow, one even joking that he must have contracted yellow fever. Not one to be put off so easily, though, over the coming years he continued to experiment with dramatic light effects in his large-scale landscapes. In Regulus of 1828, for instance, the use of yellow has become almost blinding, shattering the horizon and carving out a singular, shimmering vertical axis into the composition. This elemental collision in which light reigns supreme becomes an increasingly important motif in Turner’s later works and whether or not his last words were indeed, as legend has it, “The sun is God,” it hardly seems to matter, for in summing up Turner, no other words would seem to do. Cite this page as: Ben Pollitt, "A-level: J. M. W. Turner, The Harbor of Dieppe," in Smarthistory, May 18, 2017, accessed April 19, 2019, https://smarthistory.org/j-m-w-turner-the-harbor-of-dieppe-2/.